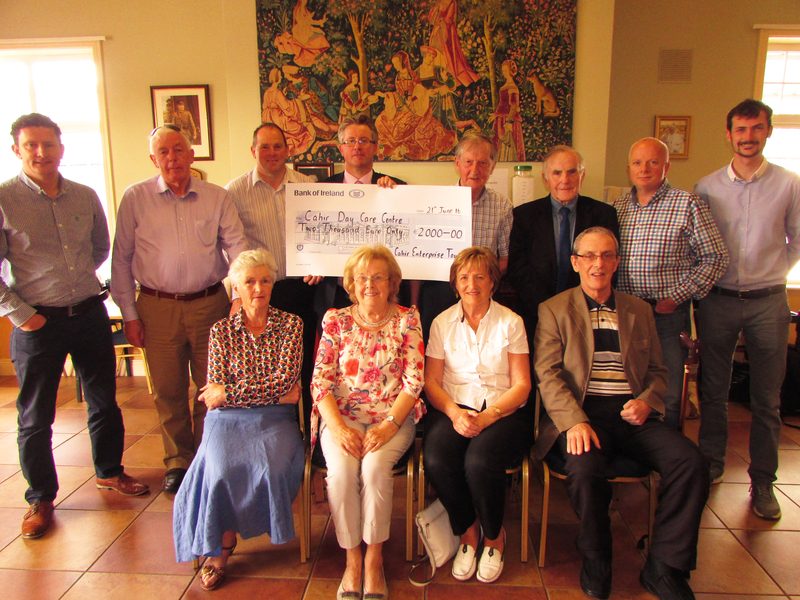 The Enterprise Town committee members presented a cheque for €2,000 to Cahir Day Care Centre committee members last Tuesday which was the proceeds raised at the Coffee Morning that was part of the very successful Bank of Ireland Initiative Enterprise Town at the Coláiste Dún Iascaigh, Cahir recently. L to R are David Walsh, John O'Donnell & Cllr Andy Moloney, Enterprise Town Committee ,Peter Lambert Manger of Cahir BOI Branch, Denis O'Mahoney & Bobby Condon Day Care Centre Committee, Patrick O'Donovan, Gareth Saunders, Cahir Media, Enterprise Town Committee. In front are Margaret Walsh, Lil Davis, Maura Horan and Peter Fahey, Day Care Centre Committee. Missing from photo were Gary Morrison, Peter Creedon, Noel O'Donnell and Con Traas of the Enterprise Town Committee.